Once it is ground, nutmeg soon loses the oils which provide its flavor and taste, so grating fresh, whole nutmeg is recommended to achieve the full benefit of the fresh oils. A nutmeg grater should be a part of basic equipment in every kitchen, but if you do not have one, use the finest blade on a larger hand-held manual grater. The difference between fresh nutmeg and commercially-ground is like night and day. Testing for good quality fresh nutmegs is as easy as inserting a darning needle a centimeter into the meat; if a tiny drop of oil seeps out, the nut is good. Freshly-grated nutmeg should ideally be added at the end of the cooking process since heat diminishes the flavor. Whole fresh nutmegs, as well as ground nutmeg and mace, should be kept in a tightly sealed jar or container in a cool, dark place. Wrap leftover fresh nutmeg tightly so the oils are not lost. Slightly sweeter than mace, nutmeg is essential to bechamel sauce and also goes well with baked or stewed fruit, custards, eggnog, punches, curries, sauces (particularly onion-based and milk sauces), pasta, and vegetables (especially spinach). One whole nutmeg grated yields 2 to 3 teaspoons of ground nutmeg. 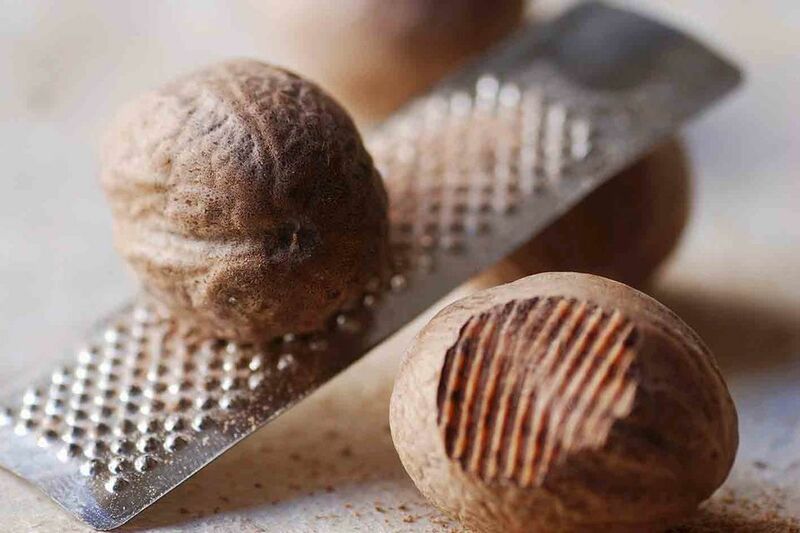 Mace may be substituted for nutmeg in a pinch and vice versa, but obviously, the flavor of the end result will be affected as with any substitution.